Once upon a time, there was a kingdom that beamed with magic and life. Then one day, greedy demons posing as gargoyles spread a curse upon it, turning the once prosperous nation into an inhospitable wasteland. The people cry out for a hero, but who could possibly save them in their time of need? That would be you of course! With the help of the Phoenix Spirit, it will be your duty to travel across the ruined kingdom, unearth the Elements of Life, and undo the curse plaguing the land. The Elements of Life are out there, and it will take every puzzle-solving skill in your arsenal to find them all and dispel the curse. Match blocks together on a three-dimensional plane. Leave nothing to chance. Plan your attack and play only the most strategic cubes in your hand. Observe where new blocks will rise, and position your cubes accordingly. 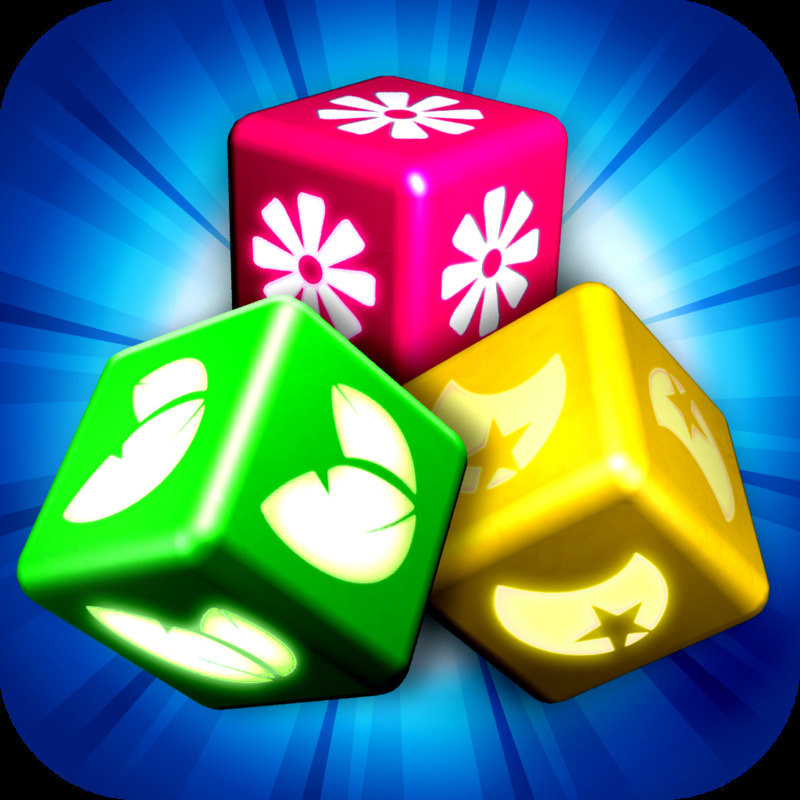 Match special cubes together and form explosive combos to remove dozens of blocks in one fell swoop! Acquire elements and elixirs to restore life in the kingdom. 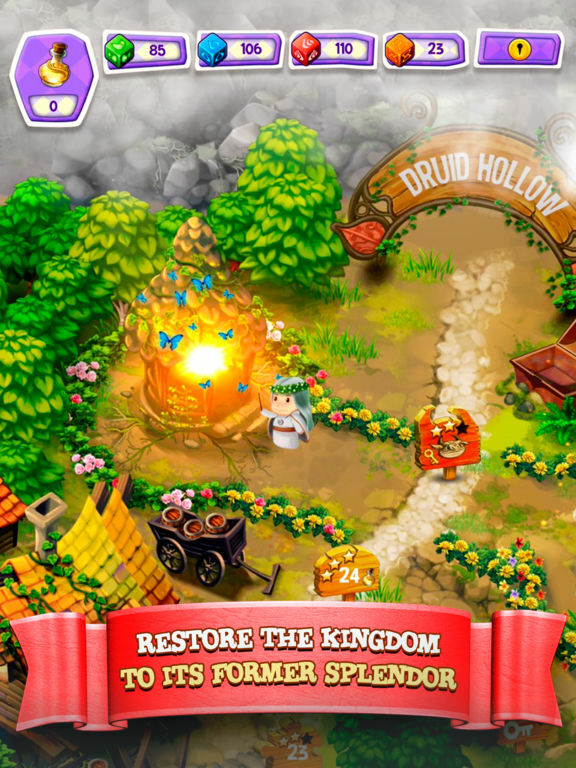 Cubis Kingdoms is a new brand of puzzle game that breathes life into a well-tread genre. If your mind is hankering for some mental stimulation, but you crave something original, then give this app a whirl. It will literally change the way you look at puzzle games! Nothing describes a game faster than the term "match-three." Say those two syllables, and you're already seeing and practically playing it in your head. You've got the grid covered with all manner of gemstones, rocks or candies, and you have the swapping, the sparkly explosions and the power-ups to help see you through it. It's a simple yet addictive formula, but to say if you've played one, you've played them all isn't very far from the truth. With that in mind, it is to this critic's great delight to say that does not apply to Cubis Kingdoms at all. While it does indeed have the fundamentals of match-three gameplay down, it really is a different beast altogether. 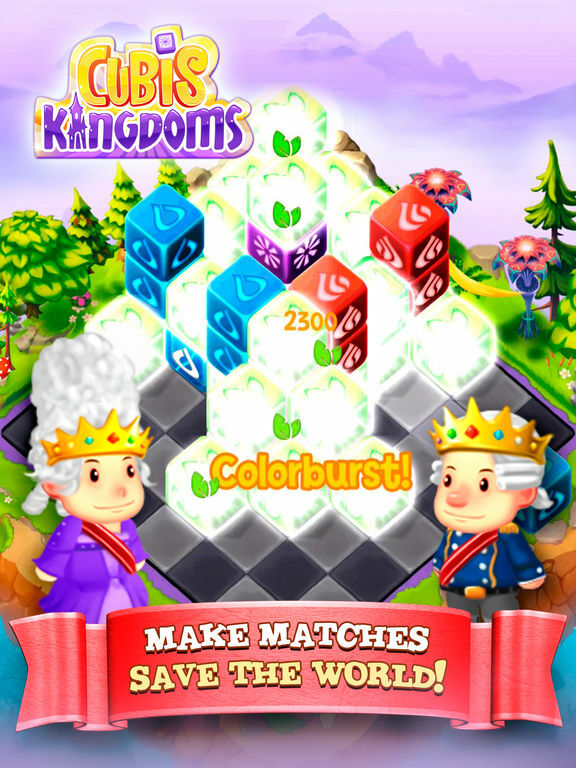 Cubis Kingdoms makes its identity clear almost immediately after startup. Instead of looking down on a 2D grid as you would in something like Bejeweled, this game takes place on a board viewed from a classic 3/4 angle. This isn't just to emphasize the game's more scenic and picturesque visuals; it's to let you see how blocks can be stacked on top of one another. Matching is done on three axes instead of two, and this opens up all kinds of new options you won't find elsewhere. You can clear out lower layers to knock higher ones down to the ground, ascend lower cubes up to match with the higher ones, or throw a cube at a stack of same-colored blocks to form a match with them. The new dimension definitely shakes the match-three formula up. More than that is how you make matches at all. Rather than swap blocks around on the grid, you throw them in yourself. You pick which edge of the board you want to toss the cube from, and it will slide along the row until it smacks into something. If it hits some matching blocks, they'll evaporate in true match-three fashion. Anything else will simply cause it to stop. However, things get more interesting when you take into account your ability to move existing blocks around. If the cube you threw in hits a lone block on the grid, then they'll both slide forward by one square. This applies even to stacks, with your cube displacing the one it hit and becoming the stack's new base. There's a lot of fun and strategy to be had from these simple mechanics, and they really alter the way you approach the puzzle-solving. One of the largest criticisms that match-three puzzlers face is how dependent on luck they are. You can't control what gems will appear, nor do you have any means of anticipating what they will be. Success or failure often depends on what appears after you make a good match. Sometimes you get a good combo going. Other times, you just get buried. This is not the case in Cubis Kingdoms at all. For one thing, the game lets you know one turn ahead of time where new cubes will appear on the board and what color they'll be. For another, you always have two cubes in your hand, and you're free to pick and choose which of them you want to toss on the grid. This gives you lots of opportunities to plan out your next move. For instance, if a blue cube is about to appear, then you can try shifting some existing blue cubes over to it to form a match on the next turn. Alternatively, if a green cube is about to show up with nothing else next to it, you'll know it'll be to your advantage to hold off on launching the one in your hand since the next turn will give you a chance to start grouping them together. These are small things, but they do a lot to make you feel in control of the game. You feel clever when you win, and like it was honestly your fault when you lose. The one thing that Cubis Kingdoms has in common with its brethren is its ever-evolving style of gameplay. While things start out pretty basic, it adds more and more tools and obstacles to help and hinder your journey. Immovable blocks appear that limit your cube placements on the grid, but you also acquire Phoenix Eggs that can take out an entire row of objects for you, including those very obstructions that were getting in your way previously. Even when Cubis Kingdoms isn't introducing new things, it still forces you to rethink your ways with interesting block arrangements. There's always an optimal way to solving these puzzles and getting the highest score possible; finding it is up to your ingenuity. Conclusion: A Match -Three Made in Heaven! There are really not a whole lot of bad things to say about Cubis Kingdoms. The story seems more like an excuse than anything, which is pretty par the course for this particular genre, and the game seems to demand a lot of power from your mobile device. It's unclear why this is the case. It is admittedly a pretty game, but from a technological standpoint, it's not that big a leap in visual quality. Regardless, if your phone can handle its demands, Cubis Kingdoms is a fine game to have. It's fun, it's strategic, it's pretty, and it rewards skill handsomely. Most of all, it's hard to put down!